A Rapid Diagnostic Test (RDT) is an alternate way of quickly establishing the diagnosis of malaria infection by detecting specific malaria antigens in a person’s blood. RDTs have recently become available in the United States. A blood specimen collected from the patient is applied to the sample pad on the test card along with certain reagents. After 15 minutes, the presence of specific bands in the test card window indicate whether the patient is infected with Plasmodium falciparum or one of the other 3 species of human malaria. It is recommended that the laboratory maintain a supply of blood containing P. falciparum for use as a positive control. High-quality malaria microscopy is not always immediately available in every clinical setting where patients might seek medical attention. Although this practice is discouraged, many healthcare settings either save blood samples for malaria microscopy until a qualified person is available to perform the test, or send the blood samples to commercial or reference laboratories. These practices have resulted in long delays in diagnosis. The laboratories associated with these health-care settings may now use an RDT to more rapidly determine if their patients are infected with malaria. The use of the RDT does not eliminate the need for malaria microscopy. The RDT may not be able to detect some infections with lower numbers of malaria parasites circulating in the patient’s bloodstream. Also, there is insufficient data available to determine the ability of this test to detect the 2 less common species of malaria, P. ovale and P. malariae. Therefore all negative RDTs must be followed by microscopy to confirm the result. In addition, all positive RDTs also should be followed by microscopy. The currently approved RDT detects 2 different malaria antigens; one is specific for P. falciparum and the other is found in all 4 human species of malaria. Thus, microscopy is needed to determine the species of malaria that was detected by the RDT. In addition, microscopy is needed to quantify the proportion of red blood cells that are infected, which is an important prognostic indicator. 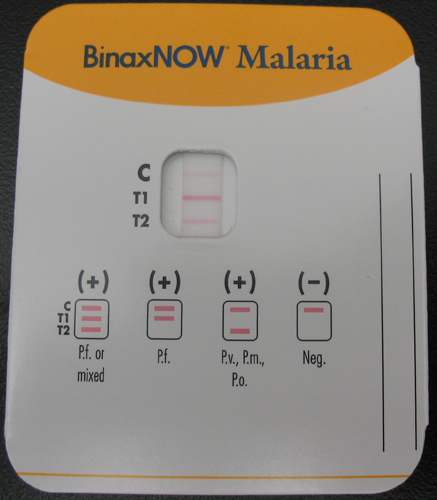 On June 13, 2007, the FDA approved the first rapid diagnostic test (RDT) for use in the United States, the Binax NOW Malaria. This RDT is approved for use by hospital/commercial laboratories, not by individual clinicians or by patients themselves. This video provides guidance regarding the test procedure and results interpretation.